Three Close Calls In A Row! I have decided to post this video because it has a lot of educational purpose. Learn and Enjoy! The draw of the motorcycle is almost universal. The freedom of the open road, the air all around you, you on a slick bike, decked out all in leather. For beginners, it looks almost effortless to cruise around on that very powerful machine. However, ask any experienced rider and they will tell you that it is definitely not as easy as it looks. You don’t have to look like a Hell’s Angel to be a biker either. Many high-level executives, doctors and lawyers find themselves strapping on a helmet. GoDaddy founder Bob Parsons is a rider with a successful career, who now owns motorcycle dealerships. 2013 is around the bend and it’s a great resolution to learn something new. Hopping on a motorcycle can be the most exhilarating hobby in the world. There are many things to consider before taking off, such as the gear, the bike, and the test. Good gear is not that hard to find. Plenty of third party websites offer affordable equipment that is still safe and will pass all the required tests. Looking for top quality gear, gloves, motorcycle helmets and other dependable companies offers great deals on motorcycle helmets, gloves and other essential gear. Once you’ve got all your gear and passed your test, take time to get to know motorcycles before you go out and buy the fastest, shiniest one in the shop. Getting some practice in on a dirt bike is a good way to get familiar with the feel of a bike before you make the commitment and purchase one. It may be tempting to jump right onto that 1200cc monster, but be reasonable. A beginner’s bike should not exceed 500cc. The Kawasaki Ninja EX250 or EX500 are perfect starter bikes, along with the Triumph Bonneville and the Honda CBR250R. The U.S. has an somewhat lenient motorcycle license test, and sometimes that can lead to serious accidents. 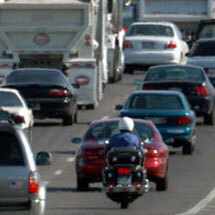 According to CDC.gov, motorcycle deaths have more than doubled between 1999 and 2008. After being in three motorcycle accidents, Bob Parsons says he rides like a scared rabbit. He takes a more defensive approach to driving by never being next to anybody and always watching whoever is behind him. Hopefully, if you are starting out, you’ve got a nice friend who’s patient and willing to teach you the basics. If this friend knows their stuff, they’ll tell you to get yourself kitted out before you even think about buying the bike itself. AGATT, or all gear all the time, is the mantra of riders who know what they’re doing. AGATT means jacket, helmet, gloves, pants and boots. All Motorcycle Safety Foundation riding courses require full gear. No matter how dorky you think you look in your leathers, no matter how hot it is and no matter how cool you think you look riding in your flip flops, that won’t matter if you go down and potentially seriously injure yourself. Be smart about riding, and it can be one of the most exhilarating hobbies in the world. Once you’ve picked your bike, gotten your certifications and your gear, you are ready to hit the road and enjoy being in charge of the open road. Martin loves swing and ballroom dancing, red wines from before 1975 and sports cars. However he could write about art and film all day and night, and on many occasions, he does. Tagged Bob Parsons, goDaddy, kawasaki ninja ex250, rider with career, tips for rides, tips for riding in 2013, tips on motorcycles, tips on where to pick your leather, tips to ride, where to ride? As we know motorcycle battery usually lasts about 2 to 3 years. If you are able to pull 4 years on the same motorcycle battery; you are really lucky. I have not changed my motorcycle battery in 3 years; however, I do feel that it is time for a change. Today I took some time to sit down and look for a new motorcycle battery, that would fit my Road King. Let me tell you that when it came to finding the perfect motorcycle battery it was a hassle. The search was so wide that I had over million search results in 3 seconds. However, the first website that showed up had decent battery prices. I don’t want to over pay for the brand, or under pay and get a cheap battery. After a while I have stumbled on ThrottleX Batteries, and their website caught my eye. Their pricing is amazing, and enjoy the coupon code by entering BON at the checkout, and saving 15% off your purchase. The order has to be placed before February 28th in order for you to receive the 15% off. Important to know that word of mouth is much better source than online shopping. Which is why I have chosen ThrottleX Batteries as my next battery. A lot of my brother and sister have recommended ThrottleX Batteries, as to being one of the best battery suppliers in the world. The part that caught my eye is MADE IN AMERICA, with 18 months warranty! This is a great deal, there is no point of ordering non Made in America battery when I can have Made in America battery for almost same price. The only difference would be 5$ because of the coupon code BON. Don’t wait! Get your motorcycle battery ordered from ThrottleX today! ThrottleX Batteries, has an awesome YouTube channel for everyone that does not know how to change a motorcycle channel. The video will show you exactly step by step how to change your motorcycle battery. I will be placing my order today with ThrottleX and you should do the same! Recently I have sat down and was thinking if I don’t miss any steps to provide the best service for my motorcycle that I can. Well I do believe that there are some things that I tend to omit from time to time. For example moving parts should be lubricated, specially now since the motorcycle is not used. After thinking about my parts I thought that I barely touched my stand to clean it from the grease. Did you know that when you ride your bike motorcycle vibrations gradually loosen parts on bike. You will not notice them loose or falling off , but you might want to pick up that wrench and tighten some parts. Monitoring your motorcycle battery is the most important of all steps of your motorcycle check up. Battery checks are the most commonly overlooked motorcycle maintenance tips on blogs, or websites. When not riding your motorcycle it is a good idea to give your motorcycle battery a good healthy charge. Regularly check the tires on your motorcycle. We all know that the proper inflation of motorcycle tires is a must. Not only it will smooth the ride, but it will help you taking on the turns. Don’t forget to evaluate your motorcycle tire tread. Now to sum this all up, it is perfect to do some of those tips more than once a year. Always take some time and inspect your motorcycle for your safety. Clear out the garage, break out your grease-stained work shirt and settle in — it’s time to restore your bike. Whether rebuilding the engine, replacing a spark plug or simply changing a tire, working on a motorcycle requires your full attention. You may be the only one turning the wrench, but you’re not alone as you fix up your bike. Take advantage of tools, resources and tips to help you as you fix up your ride. With the right help, you’ll be turning heads as you cruise down the road on your self-improved motorcycle. Before you start stripping bolts and loosening screws, you’ll need the replacement parts necessary to restore your engine. Previous generations were limited to the auto store and scrap yard to search for new parts, but the 21st century brought a whole-new parts dealer: the Internet. Filled with platforms to find great deals on any make an model, online shopping reduces the hassle and expense of finding your motorcycle. If looking for Honda motorcycle parts, check Craigslist for deals in your area, eBay to find a steal through an auction or dozens of online stores dedicated to find any part you need. It seems that the laws of personal vehicle mechanics dictate that a disassembled part will not be properly reassembled on the first attempt. This apparent reality has frustrated ambitious motorists since the dawn of internal combustion, but technology affords us a backup to the mental picture we take before embarking on a restoration project. Take pictures as you disassemble parts. When it’s time to put your bike back together, a digital copy will fill in the assembly holes that your memory can’t. The thrill of taking on a restoration project is enough to make any self-taught mechanic lock himself in the garage until the engine is running in peak form. Motorcycle repair isn’t easy, and pride can deter eager riders from hitting the road. Instead of sentencing yourself to an afternoon of frustration, collect a diverse set of references in case the repair (or engine) sputters. Online motorcycle forums contain first-person discussions of projects, and you may be able to gain insights from fellow riders that have completed similar projects. Pick a local mechanic’s brain before starting your project. His insight could save you time and money, and a phone call could save you hours of struggle. Most of the time, a motorcycle-restoration project is meant to improve the bikes performance, and a well-running engine is best coupled with an sleek body. Cap off your restoration project with wax and polish. Not only will your bike look great, the combination of a better performing engine and a made-up appearance will give your motorcycle that fresh off-the-lot feeling again. Joe Hurley ‘Jumpin’ Joe has been working on motorcycles since he was 12 years old and writing about them since he was old enough to ride. We all want to have the shiniest chrome to show off. Every biker will spend good two hours on polishing his motorcycle, this will include cleaning, tuning and waxing. Chrome plays a real role in motorcycles. With our tips we can help you get that shine on your motorcycle. Purchase either high quality chrome polish such as turtle wax, or Meguiar’s, which both can be found at your local AutoZone, PepBoys, or Strauss auto. Before applying any wax on the chrome, make sure to clean the area or surface that you will apply the polish to. After cleaning it let’s say from grease with water and soap, make sure to dry the surface for better waxing or polishing options. Never apply chrome polish directly on the surface of your motorcycle. Apply it to a rag, and work with small areas at a time. 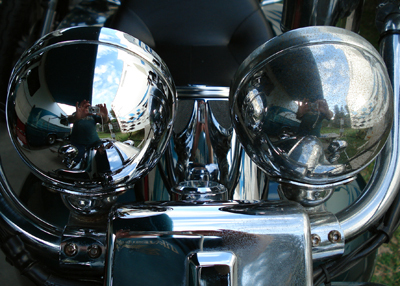 Polishing chrome in hard to reach areas can be difficult task, it might not always go the way you want it to go. However, one suggestion that we found helpful was, taking piece of wood or metal and putting a rag on it, and try to reach into those places. However, never use sharp objects, or you will be faced with scratched chrome. Spokes and other small parts can take time to polish, make sure to take your time don’t rush otherwise your job will look pretty bad. On left polished piece, on right not polished piece. Most of us just ignore the chain on our motorcycle, however it requires just as much attention as other gears on your ride. 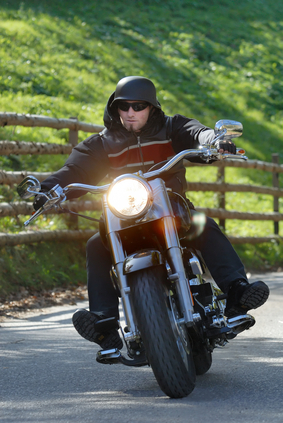 You may think that chains are not important but they play a huge role in motorcycle riding. Quick fact is that a real biker has his bike polished and maintained away from all weird noises. By doing our little steps you will be able to avoid broken chain, and caught chain in the rear wheel. O Rings play important role in your bike. O ring chains should be lubricated inside every 500 miles of riding. There are tons of lubricants available for your motorcycle, for example foam wax, foaming lube etc. Always read the back of the bottle to find out what the lubricant can do for you. Pick the one that suits your best needs. You should lubricate your chain in two locations, by spraying the majority of the lube on the inside of the chain. This will force the lube into chain while riding. The chain must be adjusted to exact requirements of your motorcycle. Grab that manual and you will be able to find the exact requirements. However, in general guidelines allow for about 1 to 1.5 inches of slack. Remember not to adjust it too tight. So basically you have to lubricate your chain often, to avoid any weird sounds or brakes in the chain. Without questioning we all know that tires should be filled up to proper tire pressure. Correct tire pressure will keep you safe on the road. Did you know that 3 out of 5 motorcycle riders check their tire pressure regularly. The survey was done by Institute of Advanced Motorists in United Kingdom. However, we know that a tire pressure system for motorcycle can cost a bit some times. It ranges from 100$ to almost 200$, depending on your needs. We found a sample tire pressure monitoring system to share with everyone as our example. 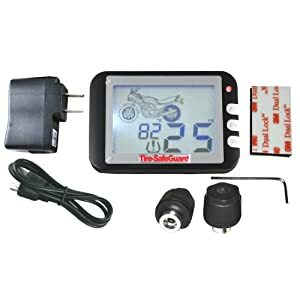 This TPMS features small LCD, rechargeable battery, support for 2 or 3 wheels, monitors tire pressure, and tire sensors. When looking for a TPMS you want to include all things that are listed above. But the most important feature you want the TPMS to do is alarm you when the tire pressure gets too low. Even if it is by blinking on the monitoring LCD or by sounding a sound. This will help you in the long run, you will know when to add more pressure to your tires. Here is product that we used as an example. Benefits of having the correct tire pressure. Price – Well pricing can vary based on the damage of the bike, or your love for the bike. However, you might want to look around on classifieds, Craigslist, bike forums, and cycle trader for current price of others for your motorcycle. You can bump the price up and down to make competition for other sellers. It is always good to keep the price range little big higher in case you will want to negotiate with the customer. We strongly recommend to look around for the current pricing, however, at the end do the judgment of your bikes condition. Looking around the web, we found this great website Nada Guides. It allows you to price your motorcycle with their qualifications like, radio, power steering etc. You get to pick the options, and they will do the pricing for you. Then you should take that information and look up the pricing on sites we have listed in above paragraph. You probably should shoot between the Nada Guides price range and your resource as well. Advertising – Advertising does not have to cost you a dime. You can advertise at Craigslist, Cycle Trader, forums, or classified ads. When advertising you don’t want to put your address, until the buyer is ready to pick up the motorcycle or test drive it. Although you should put your state that you are selling the bike in. Test Ride – If you allow for a test ride, which you should; make sure to check if the tester is qualified to be riding a motorcycle. Always, ask them to bring a DOT approved helmet for testing, you don’t want unwanted trouble with the law. Proper safety apparel should be worn by the tester. You might want to schedule test drive on a parking lot not by your house, for safety reasons. Time to Sell – Always try to aim for summer sales, due to higher pricing of motorcycles. In winter you will be forced to put the price lower as for what you would take during the summer. Sold! – Payment options can be frustrating for the seller. Sometimes it is better of that you come up with a small contract, and have the buyer sign it. Cash is preferred by any seller, but it does not always work that way. Title – Sign and date the title as seller, keep a copy of signed title for future references. Create a receipt for you and your buyer for reference. The receipt should be Bill of Sale for Motorcycle, remember that each state has different requirement it is your best interest that you check them with your local DMV or online. Here is a sample copy of Bill of Sale for Motorcycle . Registration – Don’t give the buyer your registration card for the motorcycle. Plates – Don’t allow anyone to use your plates. For your safety it is best that you turn the plates in to Motor Vehicle if not transferring them to another motorcycle. Insurance – Keep the insurance card for your records, and don’t share it with the buyer. As we all know the insurance cannot be transferred to another person. In your best interest it is better to either cancel the insurance or insure your new motorcycle. Items – Remember to remove all your personal items, like saddlebags, accessories, cup holders, etc. Keys – If you have extra set of keys, give it to the buyer. Manual – If you have the manual you might want to give that to the buyer as well. It will come in handy for beginners. There you have it, complete guide on selling your motorcycle. If we have missed some information let us know, and we will be more than happy to add it. This image is used as an example for sale motorcycle, not actual sale. Do you think this is easy? Maybe but not for everyone, for example if you are beginner you need to obey these tips more than any other rider. You want to make sure that if the other person is not paying attention you are. Safety is our goal! Notice – Make sure drivers can see you, from short or long distance. You can also wear gear that has reflective stripes on your back or in front. It is recommended that you have something reflective to wear. Watch – Constantly be on a look out. Watch drivers moves, because sometimes you can miss that lane switch when people don’t put on their blinker. Mirrors – Bike mirrors can be lifesavers, but they don’t always show the entire traffic. Slowing Traffic – If traffic starts to slow down suddenly stay on the left or right of the car in front of you. That way you can escape either right or left, and the car in front of you will see you behind him. Always check your mirrors when avoiding accident the car behind you might go the same way as you. Surface – Add asphalt condition to your watch, and be sure to lookout for spilled oil, or shiny pavement. However don’t forget about gravel.